You can now search Google Maps by neighborhood in 50 U.S. cities. Some sample searches: “bars in adams morgan dc” “museums upper east side, ny” “pizza portero hill sf“. I’ve long complained that ZIP codes are a terrible crutch used by programmers. Neighborhoods are a much more human way to search. Neighborhood definitions are fluid — even locals typically don’t agree on where one neighborhood begins and another ends. Yelp has been doing neighborhood searches for a while; I prefer their tighter borders to Google’s. 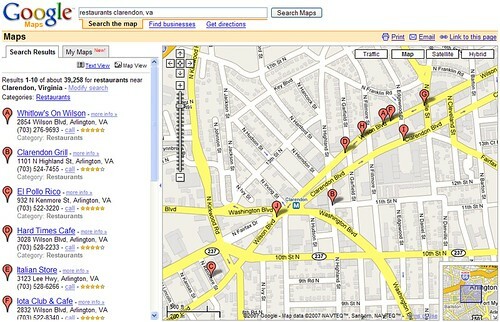 Compare Google’s results for “bars in adams morgan dc” with Yelp’s results for a similar search. Another nice touch on Yelp: the ability to narrow results based on human-friendly distances (within 4 blocks, 10 blocks, walking, biking, driving). This entry was posted in google, local search, maps, yelp. Bookmark the permalink. With neighborhood boundaries available in GIS map format from the likes of Maponics (http://www.maponics.com/Neighborhood_Maps/neighborhood_maps.html), programmers shouldn’t have to rely on ZIP Codes.